Description: Looking like it wants to the the Erie Limited, the Southern Tier picnic train passes BD on the Erie side as it arrives from Port Jervis. It will pick up here for the picnic, at Hammond Dam State Park near Wellsboro PA. Naturally, the faithful are out to record the event. Description: A pair of E units leading the Southern Tier picnic train rolls from track 2 to single track at SR just east of Susquehanna. Its not Erie power, and the tower is closed, but it still looks pretty good. 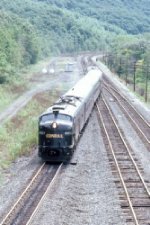 Description: The only thing better would have been Erie(or EL, Id take that any day) E 8s on this train, the Southern Tier picnic special, which ran from Port Jervis to Hammond Dam State Park near Wellsboro PA. Here it is on the famous Starrucca Viaduct, a pair of classics if ever there was one. Title: CR 4021 at Gang Mills. Description: An employee special from Port Jervis to Wellsboro, PA is arriving at Gang Mills and will head down the Corning Secondary. Description: As usual, the train was pulled by a pair of E 8s. CR 4021 was the trailing unit. Im going to hazard a guess that 4020 was the leader, though I cant find where dad got a photo of the lead unit. 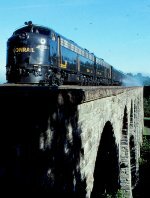 Description: Conrail's Office Car Special highballing down the main line. Location unknown. Description: An Office car Special heads north on Conrails Marion Branch bound for Goshen, IN near MP-70 just north of Warsaw IN. Description: An Office car Special heads north on Conrails Marion Branch bound for Goshen, IN near MP-143 just north of Fairmount. Description: Crossing Wilbur trestle and through the tunnel at the north end will get them to MP 87.